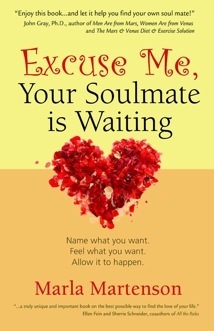 I recently had to write a short piece for Publishers Weekly on a new book called Excuse Me, Your Soul Mate is Waiting by first-time author Marla Martenson. Martenson is a Los Angeles-based matchmaker, and the book is about how the power of positive thinking can attract the right mate. The book isn’t about religion – the usual subject I write about for the magazine – but falls more into the category of spirituality and self-help. But there was one segment of it that sort of jumped out at me. The routine Martenson prescribes for attracting a mate includes a practice of daily affirmations. While these are not prayers, they reminded me of my friend Daniela, who, as I described in an earlier post, planned to use a set of prayer beads I made her for Christmas for her own set of daily affirmations. It struck me that others who may find prayer a challenge for one reason or another might find Martenson’s affirmations a good alternative to use with prayer beads. *Love pours into my life from every corner of the universe. I know that I am loved. *I see the good in others and give other people a chance. Therefore, everyone sees the good in me. *I am always open to new ideas. I have an open mind and an open heart. *My life is drama-free. i am centered and at peace. *Love is all around me. I choose to see the love. *I am beautiful and inspirational. I am a work of art. I am not in the habit of saying affirmations, with or without prayer beads. I prefer to say prayers, reaching out specifically to God. But as I say in Bead One, Pray Too, it is not for me (or anyone else) to define or limit the religion, spirituality or faith of others. So if the idea of traditional prayer does not appeal to you, you might try some affirmations – either these or others of your own. And if you are looking for a mate, take a look at Martenson’s book. I thought it was a fun, upbeat read – and I am sooooooo married. This slim book is like a prayer bead breviary – a short, concise guide to praying with the Anglican rosary on a daily basis. The book concerns itself solely with the Anglican rosary, with the bulk of the book holding a collection of prayers drawn mainly from the scripture read each Sunday in Episcopal churches. It contains a very brief introduction to prayer beads and a short description of how to use them as a prayer tool, both written by Virginia Stem Owens, a writer and an Episcopalian. The prayers, compiled by Nan Lewis Doerr, an Episcopal rector at Church of the Redeemer in Houston, are organized around the Episcopal church calendar, beginning with prayers for Advent and Christmas before moving on to Epiphany, Lent, Easter and the season after Pentecost. Each season is introduced by a short description of the importance of the season to the church. Each day’s prayer is laid out like the daily offices of the church, with prayers for morning, noon and evening. Particularly helpful are the symbols used to show what prayers are assigned to the different beads – those for the cross are preceded by a small cross symbol, those for the invitatory bead have a small donut, the cruciforms have a kind of four-petalled flower and the weeks get a black bullet. In this, the book owes a debt to Phyllis Tickle’s series of prayer books, The Divine Hours, which has similar symbols before the different prayers of the day. Use of these symbols makes it easy for the eyes to know which prayers go with which beads without having to fully engage the mind – very important in contemplative prayer. The book is aimed at Anglicans and other users of the Anglican rosary, but with some adjustment it could be used with a Catholic or Lutheran rosary, a set of Pearls of Life or other form of prayer beads you may have made for yourself. On the Catholic rosary, prayers assigned here to the weeks beads could be said on the decades beads and those for the cruciforms could be said on the Our Father beads. The Lutheran rosary is similar in format to the Anglican rosary and would require even less adjustment. And the total free-form nature of the Pearls of Life allows one to take any of the prayers in this book and assign them to any of its 19 beads.